I have an unpleasant memory from Sunday School many. many years ago. I was supposed to memorize the Bible verse of the week, but I hadn’t. My older sister had. Feeling like a failure, I practiced the verse over and over again in the car on the way. When the teacher handed the little stickers and prizes out to the other kids as they recited it, I blanked. I didn’t get a sticker. What strikes me about the story is that I remember the sticker, but not the verse that I was supposed to know. Maybe this is why I like the Charlotte Mason method so much. External motivations, like stickers, prizes, and even praise, left me feeling inadequate so many times as a child. I want my children to fill their hearts with the inspiring words of scripture, but I don’t want to approach this in a stressful way. They should enjoy the process and the prize is the fact that these priceless words are in their hearts. I tend to disagree with Charlotte Mason’s advice regarding spirituality in the early years. We read Bible storybooks instead of the real Bible (you can read about that here) and I encourage scripture memorization before the age of six, which she did not. But, one of her approaches to scripture memorization seems perfect for the early years. Related: Was Charlotte Mason Against Kindergarten? I recently read what Charlotte Mason had to say about memorizing worthy words, recitation, in Home Education. She said that the words should be read to the child as they play or prepare for the day. Just by gently rereading it a half-dozen times or so, the child will soon remember it. No “repeat after me’s” or sticker chart motivators. 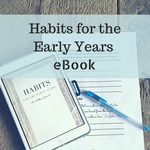 Miss H memorized her first Bible verse at the age of three. We started with Psalm 118:24: This is the day that the Lord has made. Let us rejoice and be glad in it! When I greeted her at her bed in the morning, I said the verse. When we had a happy moment playing together, I repeated it. Soon she started saying it with me. Then, I got her started with, “This is…” and she completed the verse herself, with a joyful smile on her face. We moved onto another verse, and she seemed to understand right away that the end-goal was to memorize it, even though I hadn’t stressed that fact. It’s Ephesians 4:32: Be kind and compassionate to one another, forgiving each other, just as in Christ God forgave you. We discussed the word “compassionate,” and when she heard that same word on the radio station that we listen to, she was so excited! Although the purpose of this is to make recitation enjoyable, it’s also important to encourage clear pronunciation and intonation. These things help your child in everyday communications. On the same note, I didn’t worry about Miss H memorizing the chapter names and verse numbers in Bible recitations until she learned how to count well! Bible verses are worthy words to remember during the early years, but as they begin formal lessons, they can memorize shorts poems, sayings, or nursery rhymes. Doing this helps build vocabulary, communication skills, and, if the right text is chosen, introduces them to inspirational ideas. You don’t have to avoid words that your child doesn’t know. As long as there aren’t more than a few unfamiliar words, it’s a great learning opportunity. You can start with short verses or phrases, but children are capable of pretty long recitations! Once the verse, poem, or other text has been memorized, reviewing it every once in awhile helps them keep it in their memory. Finding moments where the text is applicable is a great way to incorporate it. These verses are short but meaningful for the early years. I love this! Going to start using this method today! Thanks for sharing! Thank you, Bre! I’d love to hear how it goes! Thanks for stopping by! I definitely think this is appropriate for older children, too! This is awesome and so very helpful. I have been working on scripture memorization and recitation with my children. Pinning this to my Deliberate Homeschooling board. I love this! I think I need to research Charlotte Mason. I was a Kg teacher, till I had a nervous breakdown. Now, I have 2 grands. I just decided to start with the almost 3 yo memorizing Scripture. So timely that I saw this on Bloggers Pit Stop! I am so glad to hear that this method piques your interest- that is what I hope will come from this blog! Please let me know how this memorization approach works for your grandchild! super idea! thanks for sharing. I love this! Verses have so much more power when they’re part of an authentic daily walk with Jesus. One of my favorites that we talk about through the day is from Psalm 19: May the words of my mouth and the meditations of my heart be pleasing in your sight, oh Lord my Rock and my Redeemer. That verse is a great suggestion, thank you! It has some good vocabulary in it!